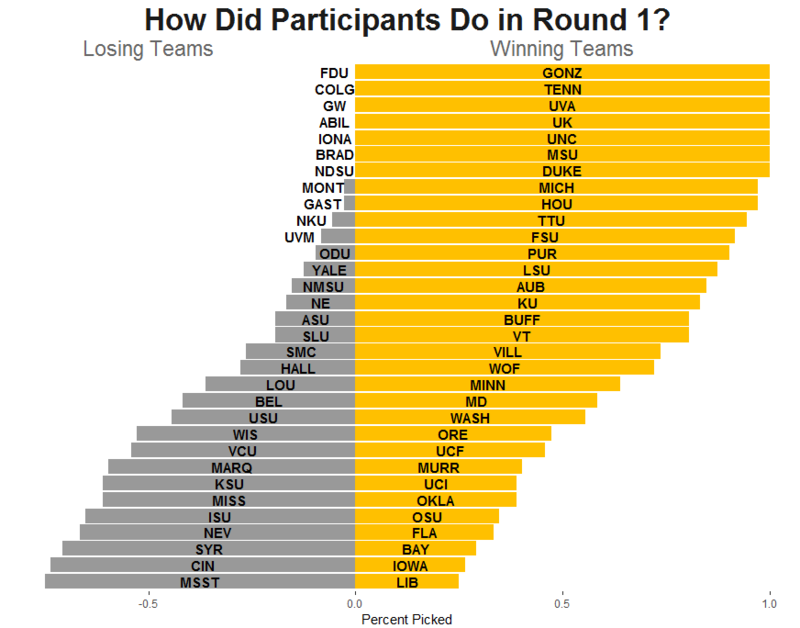 The first week of March Madness is in the books, and so far the tournament has been more predictable than usual. Five teams seeded 11 or higher made it past the first round, but only one of those—Oregon—made it through to the Sweet 16. They, along with five-seed Auburn, were the only teams to advance through the first two rounds who weren’t seeded four or lower. All this chalk means the brackets in our Model 284 pool are in pretty good shape. 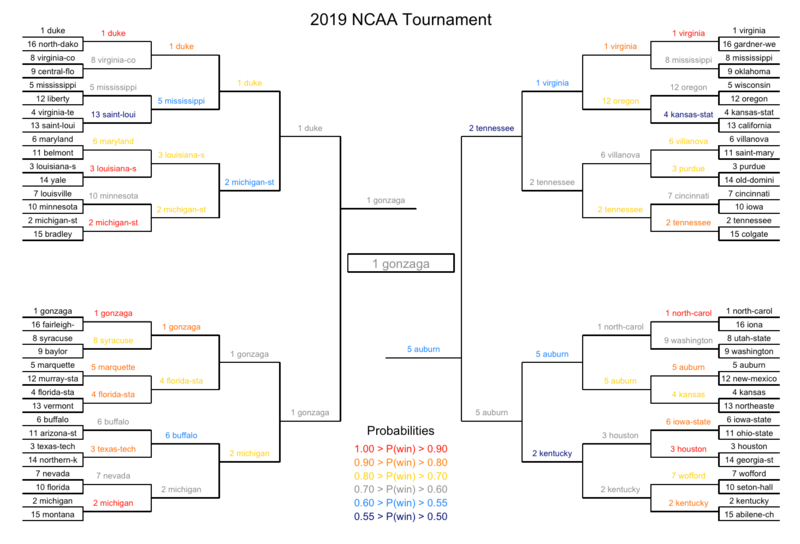 None of you has lost your champion or runner-up yet, a remarkable occurrence given that thirteen different teams were finals picks of one bracket or another. Fifty-eight of your seventy-two entries haven’t lost a single Final 4 team. Thirty-one of you could still have a perfect Elite 8 as well. Last year at this stage, the leader had 470 points. This year, in a pool of almost the same size, thirty people have a higher score than that. And it’s not just our pool who has had it good; for the very first time, someone in the NCAA Bracket Challenge picked the first two rounds perfectly. So long story short, your brackets look pretty good. All of you correctly picked all of the one- and two-seeds, save for the brackets “JGR Official” and “Official 2”, which officially got too cute by picking Montana over Michigan. Liberty, Iowa, and Baylor’s victories threw you off the most, but even still, each of those teams were picked by around a quarter of you. Your Sweet 16 picks were equally impressive. 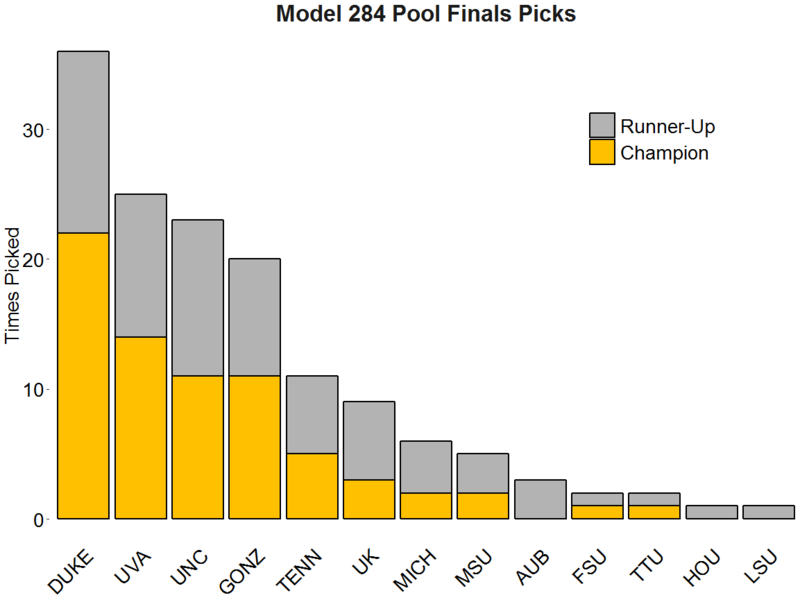 Everybody picked Duke to make it to the second weekend, though UCF came dangerously close to proving you all wrong. 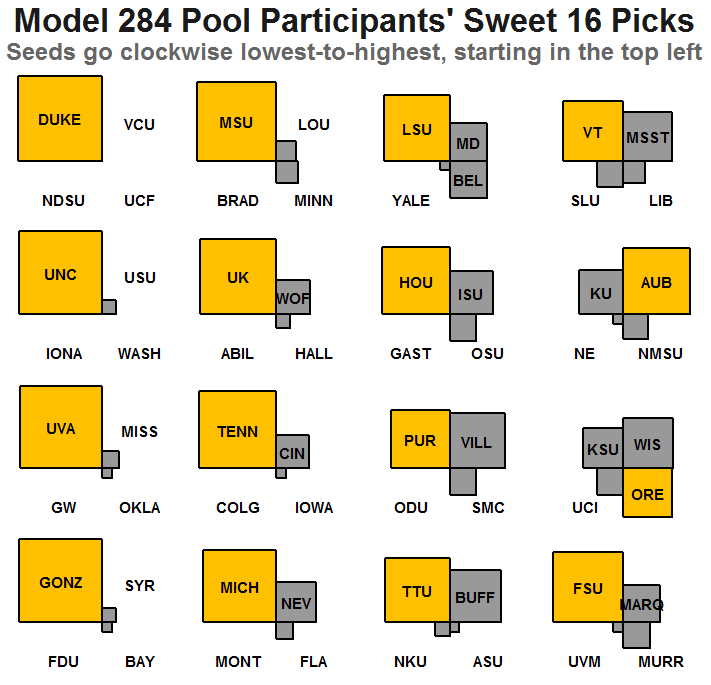 Save for one, each given Sweet 16 team was picked more frequently than the three others vying for its spot. The exception was 12-seed Oregon, and even then, they were picked by more of you than 4-seed Kansas State and almost as many as 5-seed Wisconsin, Oregon’s two lower-seeded competitors. Looking ahead to the rest of the tournament, it’s anybody’s game. With everybody’s finals picks still in the running, the rest of the tournament will be an exciting watch! Good luck to all of you.